The Kavalkade Ergonomic Ivy Bridle with Lambswool has all the features of an ergonomic bridle for a comfortable fit for the horse. The English noseband with flash is fixed to the head piece on both sides which reduces pressure on the horse's poll. The noseband is softly padded with a special curved cut to keep the check bone clear. The extra wide anatomically shaped and softly padded crown piece allows for extra comfort and freedom for the horse's ears. 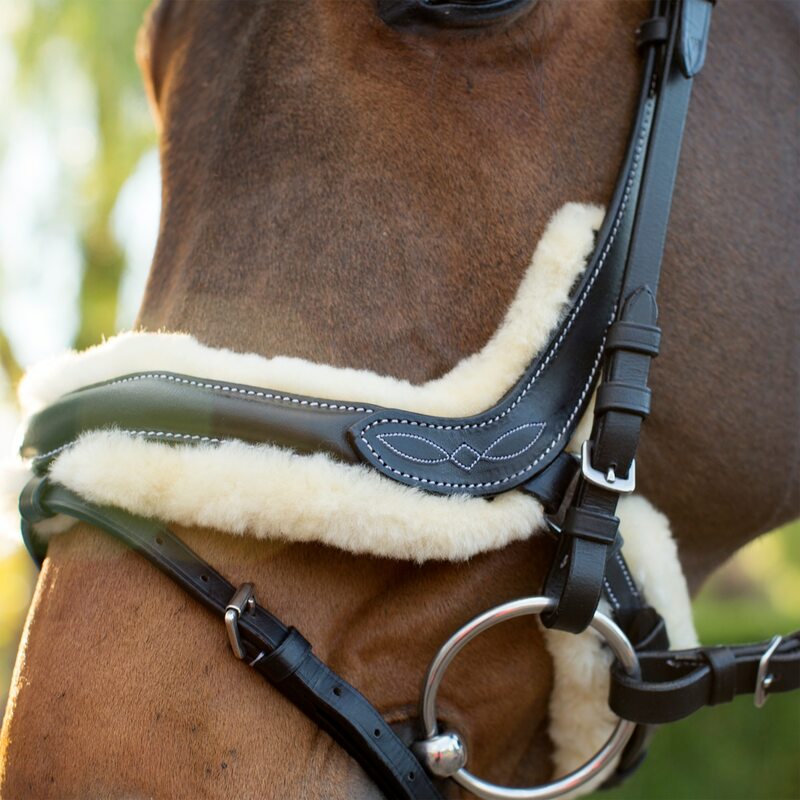 The browband is curved and the contrast stitching and decorative embroidery give this bridle a very elegant look. For additional comfort this bridles offers removable real lambswool on crown and nose. For best care, wash lambswool in cold water with a non-bleach detergent, lay flat to dry. Clean leather with saddle soap and condition with beeswaxed based crème, no oiling is required. Has all the features of an ergonomic bridle for a comfortable fit for the horse. The English noseband with flash is fixed to the head piece on both sides which reduces pressure on the horse's poll. The noseband is softly padded with a special curved cut to keep the check bone clear. The extra wide anatomically shaped and softly padded crown piece allows for extra comfort and freedom for the horse's ears. 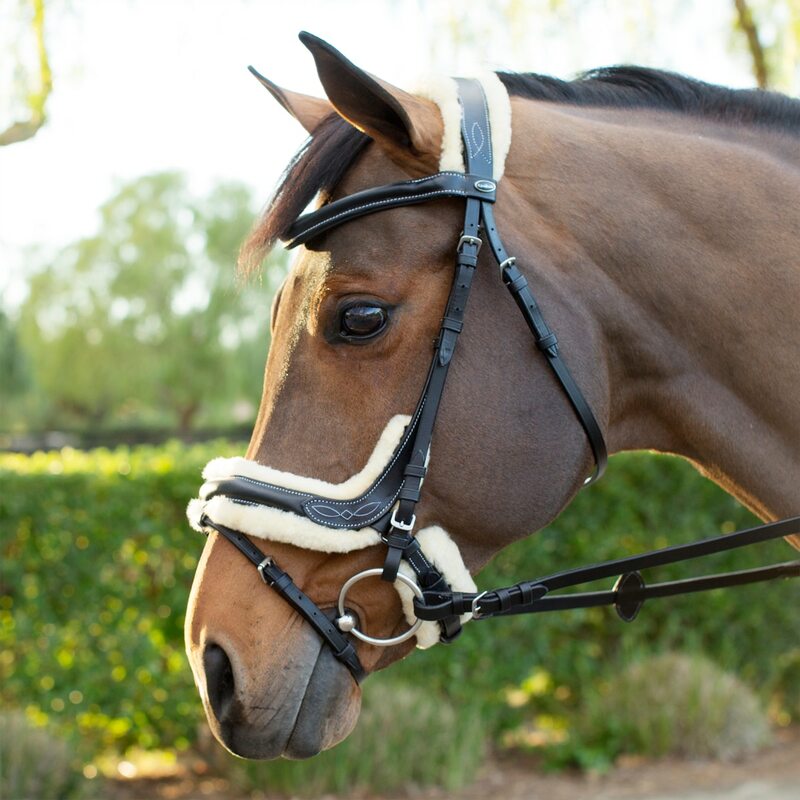 The browband is curved and the contrast stitching and decorative embroidery give this bridle a very elegant look.